On Wednesday we had quite the crowd at the farm. 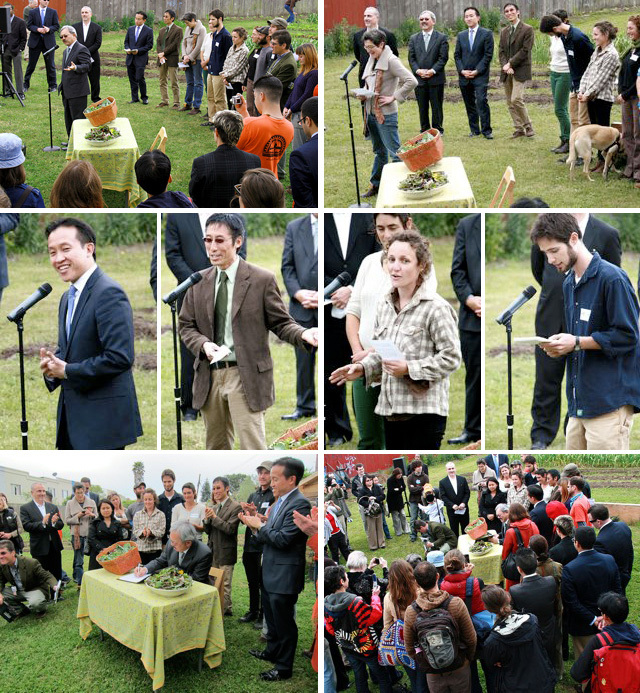 Mayor Ed Lee, Supervisors Eric Mar and David Chiu, representatives of the SF Planning Department, members of the SF Urban Agriculture Alliance, reporters and photographers, neighbors, supporters and friends were all gathered at Little City Gardens to celebrate the new urban agriculture zoning code, to talk about its significance, and to watch the mayor sign it into law. Although it was slightly overwhelming to see so many cameras and suits at the farm, it was a momentous occasion to celebrate this small but significant step forward for urban agriculture. Among the people who spoke (Mayor Ed Lee, Eric Mar, David Chiu, Eli Zigas of the SFUAA, Karen Heisler of Mission Pie, as well as Caitlyn and I), the overwhelming sentiment was that urban agriculture is a healthy activity to encourage and an important business sector to foster in our city. Now that a few politicians have been out to the farm, enjoyed the fresh air and sweet smell of food growing, we hope they will continue to act upon those encouraging words, as we are sure to need help crafting more urban ag policy in the future. A number of articles were written about the passage of the legislation.